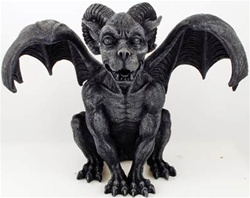 Used in medieval architecture to channel rain water, Gargoyles have developed a popular mythology in modern times as symbols of protection and good luck, and figures that can help in protecting against evil spirits and negative influences. This ram-horned gargoyle lends the impression almost of a loyal hound, with a canine-like face and body contrasting with its human-like eyes and bat wings that extend from its shoulders. Place it in your home or upon your altar to bring its protective presence into your life. Made of cold cast resin, the ram horned gargoyle measures 6" tall and 8" wide at its widest point.